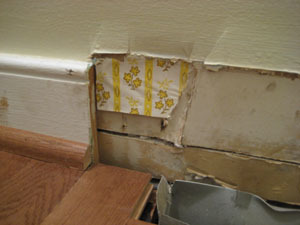 Remember that we found after the chair rail in our dining room turned third bedroom? Well, over the past couple of weeks we’ve uncovered some other “interesting” design choices made by the original owners. I can’t even wrap my mind around how this floor and the paint looked with the . And we thought the last owner had a strange aesthetic. Thank goodness he protected us from some of the decisions the original owner had made! Sheesh. There must have been a serious fake brick trend going on in the 70’s because my parents had the same kitchen floor!! You just unearthed many fond memories of dropping something on the floor and then not being able to find it due to the dark business. I wonder how many other people have had that exact flooring…weird. Hysterical. Somewhere someone in California is probably uncovering the same faux-brick flooring as it seems to have been all the rage back in the day. Thanks for the comment. Smoooch! OMG…too funny. We didn’t have faux brick, but in our brand new in 1977 house my mom put some very Moorish looking dark brown and harvest gold ultra patterned flooring down in the kitchen and if you ever dropped anything you actually had to lay down and look across the floor with one eye closed to find it! I have been reading your blog for quite a few months now and i love it. I decided to read the archives and came across this post. I had to post a comment on your “faux” brick floor. 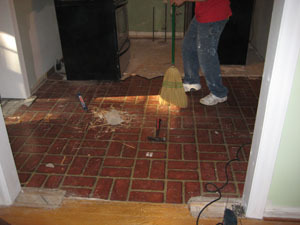 I had this “faux’ brick floor in my VERY old house as well. It was the most horrible stuff to remove but I was so happy to say fairwell. That’s too funny! Love that it was once a “staple” back in the day! The two things that come to mind are either painting them (you can use our “How to Paint A Brick Fireplace” tutorial, but use floor paint instead of regular paint) or, if possible, maybe run new floor over them. Thank you for the suggestions! I’d never even thought of painting the floor. I’ll have to look into that! I know eventually (probably in 5+ years) we’ll replace the brick with hardwood, but it’d be nice to have a temporary fix. 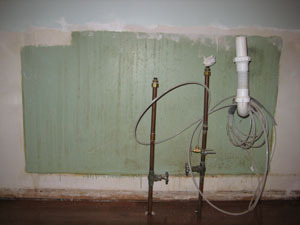 I really really loved seeing the before photo with the avocado green stove. Because…. wait for it… we got one of those when I was a kid!!!! I think my mom might still have it tucked away (not working) somewhere. The best part of that was the MICROWAVE on top!!! OMG A MICROWAVE!!! I still remember putting a frozen loaf of bread in there to defrost, and it had a wire tie closing it with a metal wire and… the frozen loaf caught on fire! I was probably 9 years old. OH MY GOSH FIRE!! THE MICROWAVE IS ON FIRE!!! (not really, just the bread). That being said, I do not want one of those stoves NOW. PS. The bread caught on fire in maybe 1977? Old Skool. Oh my gosh, that’s hilarious! Um, is that the same faux brick that is in your current kitchen?! Yes! Isn’t that hilarious!!! Our first house’s dining room also had floral paper and blue trim just like this one!